Call 910-398-4135 and reserve your date! Our popular and affordable "Officiant Only" is perfect for couples looking to get "Hitched at the Beach" for a no frills yet romantic ocean-side beach wedding ceremony. See all that is included below. Customize our wedding ceremony to make it your own lifelong experience right here in our wedding store under the A La Carte tab. Hitched at the Beach "Officiant Only" Myrtle Beach Wedding Ceremony. Wedding officiant to perform your ceremony. Ceremony will be scripted and professionally presented. Choice of vows... religious, traditional etc. Complete, notarize and file your marriage license with the courthouse. You select a date and our officiant will select an available time. Other locations available with additional travel charge. Call or email for quote! Click ADD TO CART button below to submit your payment in full, Call for other payment options. If you submit a reservation time, date or location that is not available we will work with you to find an acceptable alternative. If we can not your deposit will be immediately and cheerfully refunded! Wedding reservations will be confirmed within 24 hours of receipt of your deposit in our online store. Congratulations and thank you for choosing Hitched at the Beach! See your custom wedding package in the cart! Our popular and affordable "Romantic Beach Wedding Package" is perfect for couples looking for that perfect no frills yet romantic ocean-side beach wedding ceremony. See all that is included below. Customize our wedding service to make it your own wonder lifelong experience right here in our wedding store. Hitched at the Beach "Ceremony Only" Myrtle Beach Wedding Ceremony. Hear adorned by two small beautiful palm trees. Conch shells at the base of the palms. Unlimited email and phone consultation to make your special day and ceremony a beautiful process. Photographs - Bring your camera or smartphone and our officiant will take up to 20 keepsake photos. Click ADD TO CART button below to submit your payment in full. Call for other payment options. If you submit a reservation time, date or location that is not available we will work with you to find an acceptable alternative. If we can not your deposit will be immediately and cheerfully refunded! Wedding reservations will be confirmed within 24 hours of receipt of your deposit in our online store. Congratulations and thank you for choosing Hitched at the Beach! 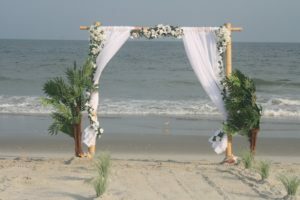 Our popular and affordable Bronze Myrtle Beach Wedding Package is perfect for couples looking for that perfect no frills yet romantic ocean-side beach wedding ceremony. See all that is included below. Customize our wedding service to make it your own wonder lifelong experience right here in our wedding store. Hitched at the Beach "Bronze Package" Myrtle Beach Wedding Package. Includes One color wedding arbor. Heart adorned by two small beautiful palm trees. Click ADD TO CART button below to submit the required $150.00 Deposit. If you submit a reservation time, date or location that is not available we will work with you to find an acceptable alternative. If we can not your deposit will be immediately and cheerfully refunded! Wedding reservations will be confirmed within 24 hours of receipt of your deposit in our online store. Congratulations and thank you for choosing Hitched at the Beach!